they are cleaned on a daily basis and the ph levels and such are regularly checked. The food was of a reasonable standard with a good range of things to choose from, Vegetarians were catered for also, with friendly catering staff who do their best to make you meals enjoyable (just ask and they will happily help) waiting staff were excellent too. Mariea the hotel entertainments lady tried really hard to entertain the guests and was the life and soul of the party, Mariea made my little girls holiday really enjoyable. We would happily recommend this hotel and are looking forward to returning again in the future. This is a lovely 3* hotel and in my opion it was much better than many 4* hotels I have stayed in, pleasant staff from reception to the room cleaners, pool area well kept and plenty of sunbeds, entertainment pool based during daytime, didn't stay in hotel for evening entertainment but there was a kids disco and different shows after that. Very nice dining room with plenty of food choices, something for everyone. Drinks in the hotel were quite expensive, 3 euro for a large coke. You can hire a safe at 24 euro for one week and you can hire a fridge but i think it was a bit expensive. I would return to this hotel. My husband and I stayed in this hotel for 3 nights as we had just finished a weeks cruise and wanted a bit of a more restful break before we travelled home. We found the hotels was very clean and tidy at all times. the food was a reasonable and the location was perfect the hotel is across the road from the beach and all the bars are up the hill. We had a complementary bottle of cava and a basket of fruit on our arrival at the hotel. The staff are very friendly and polite at all times. We will definitely be using this hotel again. food was very boring. Was the same thing nearly every night. Chicken fillets are coming out of my ears. Also they ran out of some things on the menu half way through the evening. I found there standards to be very poor. Swimming pool is not heated outside peak times so the water was ice cold when we were there hardly anyone went into the pool. A bit noisey at times with kids running up and down the corrider at all hours of the night and don't think the room walls are thick as we always heard the people coming in next door and having a row no consideration for other people. Hotel is right across from the excellent beach. This is a quality hotel, very clean and has a excellent position. The food was of excellent quality and nicely presented. The staff spoke good English and were very helpful. The entertainment was kareoke and bingo and quizes and only one show per week. I would definately stay again. We first visited this hotel in May 2005 and have stayed here numerous times since. The hotel is located just across the road from a lovely clean beach with numerous shops in the immediate vicinity. The rooms are medium sized with extremely comfortable beds, a full bathroom, ample hanging space and drawers, and a full bathroom. The air conditioning is very efficient,bedlinen is changed twice a week and towels are changed whenever you wish. 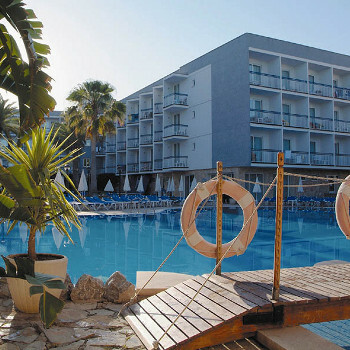 Pool towels are available for a 10 euro refundable deposit and can be changed daily. The rooms are cleaned daily and are spotless as is the whole of the hotel. The food is excellent with numerous choices for both breakfast and dinner and a chef cooking other choice dishes while you wait. All the staff are friendly and efficient but the pool barmen/barmen, Alphonso and Antonio and Haysoos(sorry about the spelling) in the dining room are outstanding for their extra friendliness and efficiency. The entertainment team, Wim and Caroline are, in my view, superb and one of the reasons why we return to this hotel. They are both so friendly and will go out of their way to be helpful. Wim organizes daily events for the adults while Caroline organizes daily activities for the children. They help with music and lighting for the professional acts and organize a quiz and bingo. To hear Wim calling bingo numbers in multiple languages is entertainment in itself. If you like good food, comfortable rooms and a friendly atmosphere in a pleasant resort then we can recommend you holiday at this hotel. Very Noisy room. Room faced MacDonalds and busy side street. Lots of noisy Irish. Did not get any sleep at night. Got food poisoning from hotel restaurant. Moved to Palma half way thru holiday for quieter time. A fantastic hotel to say it is only a 3 star - I personally think it should be a 4. I stayed for 2 weeks and we never got tired of the hotel food. The variety was excellent. The location couldn't be better as it's right on the sea front. The entertainment was also very good. A few of the evenings shows were middle of the road, but most were very impressive and worth watching - particularly the Brazilian Dancers and the Moscow State Circus Acrobats (might sound cheesy but they were actually very professional!). The only down side is that some of the rooms can be very noisey. My sister had a view of McDonalds - not great - but it was really quiet on a night. My room had a lovely pool view but we were directly above the outdoor stage, and as the entertainment didn't finish until midnight it was very noisey. Not a major problem, but not brilliant if you have young children. For reasons I wont go into here, we arrived at 3am on Sunday morning and were greeted by a friendly member of staff who checked us in. During our stay the reception staff were always professional and helpful, the pool waiters were very hard working if a little straight faced at times. We usually found someone who spoke or at least understood English. In fairness some of the staff spoke very good English. A special word for the Restaurant staff who were both extremely efficient and friendly. Get down for your evening meal at 19:30 to see everyone, including the chef, lining up to greet you. There was a good selection of food both breakfast and evening, the only criticism we can think of is that the breakfast bacon and sausages weren't to our taste. As has been mentioned before, the 'pint of beer' for 2.5 Euros is a good buy and a good tipple. The entertainment we found to be varied, but of mixed quality. We particulally enjoyed the Spanish dancers one night, but watch out for the dodgy Elvis impersonations - although we must say he went down a storm with the Spanish! We found getting a sunbed around the pool not a problem, so people weren't parking their towels and disappearing as often happens. The room had a double, single and a camp style bed with a good sized bedroom and also bathroom. More storage space would have been ideal but that provided was adequate. All rooms appeared to have a balcony of some sort and ours was on the side looking up the hill and the view wasn't bad. Overall the 3 star rating is fair although we would perhaps place it towards the top of the category.